Laser tattoo removal uses carefully selected laser light that fragments and/or breaks-up pigments that have been tattooed into the skin. Because the wavelengths for tattoo removal have been matched to the absorption rate of the ink, most removal can be done without damaging the surrounding tissue. Not all tattoo removal is performed the same and therefore, saturation of ink(s) can vary greatly from artist to the next. Saturation, artistry, and quality of inks used by an artist will affect exactly how many sessions one may need to remove the tattoo. Blood circulation plays a crucial role in tattoo removal. Tattoos located close to the heart are easier to remove and typically heal better and faster than those on extremities (like wrists or ankles). Patients with pigmentation issues (darkening or lightening of skin) need to take special care with tattoo removal. They may have to wait longer between appointments or until the skin reverts to its normal colour before pursuing another round of treatment. 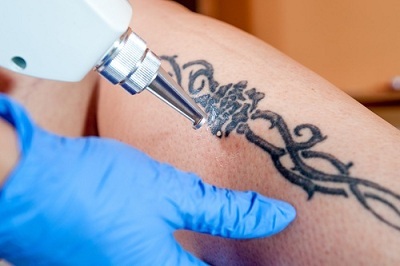 With the absorption of ink, the tattoo removal process generates heat and will cause varying levels of discomfort. While everyone’s tolerance is different, most patients consider the pain comparable to that experienced when receiving the initial tattoo. Before committing to treatment, patients should understand that laser tattoo removal needs to be treated with respect, just like any other medical procedure. Redness, swelling, bleeding and tenderness. Immediately or a few hours after treatment, you may experience these side effects. They are temporary and dissipate within a few days. Bruising, scabbing, and blistering. These reactions may appear a short time after the treatment, and take a while to heal. They are normal responses to laser tattoo removal and should disappear within 1-2 weeks. Infection and scarring. Avoid more serious problems by following the aftercare instructions of the technician or doctor who treated your tattoo. If there is pre-existing scarring on or near the area, this treatment will not remove it. Darkening. Certain ink colours (like white or those used in cosmetic tattoos used to apply permanent “lipstick” or cover scars) are likely to darken, initially, after treatment. However, follow-up sessions will help the ink disappear over time. Hyperpigmentation and hypopigmentation. Hyperpigmentation is the overproduction of melanin, causing treated skin to become darker than the original skin tone. Hypo pigmentation is the opposite, where there is a lightening or whitening of the tissue in the treatment area. Darker skin tones are more susceptible to pigmentation problems. These issues can be avoided with a more conservative approach, including longer treatment intervals and the use of wavelengths not easily absorbed by melanin. Laser tattoo removal, when administered by medically supervised technicians, is a safe and effective method of removing tattoos or fading tattoos for revisions. Clarity Medspa & Laser Centre employs a team of highly trained and skilled technicians equipped with state-of-the-art technology to handle your needs safely and efficiently. Call us at (416)960-2222 to schedule a free consultation for laser tattoo removal in Toronto.